The Roku Premiere Plus is a set-top streaming box that you can hook up to your TV and watch Netflix, Hulu, and more. If you are thinking about cutting your cable cord, or if you are just looking for a good way to watch your streaming services on your TV instead of on a computer, then this is the sort of device that you want. But there are a number of different devices in this market, and determining the right one for you is a difficult decision, based on a number of factors. Will it work with your TV? is there a way to watch the content you want? Is the device fast and stable? Is something else better? These are all questions that you will inevitably need to answer as you are shopping around for your set-top box. If you are considering the Roku Premiere Plus, then hopefully the list of questions and answers below can resolve any concerns that you had about this. Question 1 – Does the Roku Premiere Plus have the channels that I want? Answer 1 – The Roku Premiere Plus (and other Roku models, for that matter) has perhaps the biggest libraries of streaming channels available between the Fire TVs, Apple TV, Chromecast, and other similar devices. The most popular streaming channels, such as Netflix, Hulu, HBO, Amazon, Vudu and YouTube are all there, as well as hundreds of others. You can browse the Roku channel library here. Question 2 – How much does the Roku Premiere Plus cost? Answer 2 – It’s hard to give an exact price for the Roku Premiere Plus because the cost can vary so much based on the date, the store at which you are shopping, etc. You can view the product page on Amazon to see the current price. There is also a refurbished version of the Roku Premiere Plus on Amazon that is a little less expensive, if you don’t mind buying a model that has been used and restored. Question 3 – Does the Roku Premiere Plus have an ethernet port? Answer 3 – Yes, there is an ethernet port on the back of the device in case you either do not have a Wi-Fi network in your house, or you would prefer not to connect the Roku in that manner. Question 4 – Can I connect the Roku Premiere Plus to my TV if it doesn’t have an HDMI port? However, this type of connection if notoriously inconsistent, so you might discover that the signal drops out frequently. This is often due to something called HDCP compliance, which can prevent the video from being displayed at all. This type of connection is also not able to produce high-definition signals, so you will be stuck with a maximum resolution of 480p. Question 5 – What is the monthly fee for the Roku Premiere Plus? Answer 5 – The Roku Premiere Plus does not have a monthly or yearly fee. All you need to do is purchase the device, then you are done paying for it. However, many of the streaming services you subscribe to will have their own fees associated with them. For example, Netflix has a monthly fee, Amazon Prime has a yearly fee, and Hulu has a monthly fee. Additionally, many newer movies, as well as some older ones, are not available on streaming services, so you will need to pay to rent or purchase them instead. Question 6 – How fast does my Internet need to be for me to stream movies to my Roku Premiere Plus? If you are unsure about how fast your Internet connection speed is, you can visit fast.com to run a test in your browser which will display the connection speed of your current network. 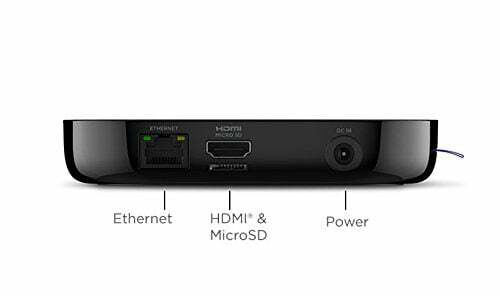 Question 7 – What ports are on the back of the Roku Premiere Plus? Answer 7 – On the back of the Premiere Plus is an ethernet port, an HDMI port, a microSD port, and a power port. Note that there is not a USB port, meaning that you will not be able to connect a flash drive or an external hard drive if you would like to watch local video files on the device. However, you can connect that device to your computer and use a service like Plex to stream local video files on the Roku. If you would like to get a device with a USB port, you can check out the Roku Ultra. Question 8 – What does the Roku Ultra have that the Roku Premiere Plus does not? Answer 8 – The Roku Ultra has a USB port, digital optical audio, Dolby Audio, a remote finder, and gaming buttons. The Premiere Plus does not have any of those features. Question 9 – What can I do if I lose the remote control for my Roku Premiere Plus? Answer 9 – The Roku phone app is available for iOS and Android, and lets you control Roku devices on your network. So, for example, if you had three Roku devices connected to various TVs in your home, you could use the Roku app to connect separately to each one and control them as needed. Alternatively you could buy this replacement remote control for the Roku Premiere Plus and pair it with your set-top box. Question 10 – How is the picture quality of the Roku Premiere Plus? Answer 10 – The quality of the picture is very good, but will depend on your TV, and the speed of your Internet connection. The device is capable of displaying up to 4K resolution with a compatible television set and a fast Internet connection device. if you meet these requirements then you will be happy with the output from the Premiere Plus..
Perhaps one of the biggest drawbacks to the Premiere Plus is its price. You can read our Amazon Fire Stick FAQ for a glimpse into one of the less expensive options for this type of device.